Sports fans are known to be rabid followers of their local teams. However, every game has a visiting team too, and that can provide an opportunity to see a star player or hot team in your hometown. But which visiting teams do fans care most about seeing? If the visiting team is full of star players, do more fans seek out tickets? 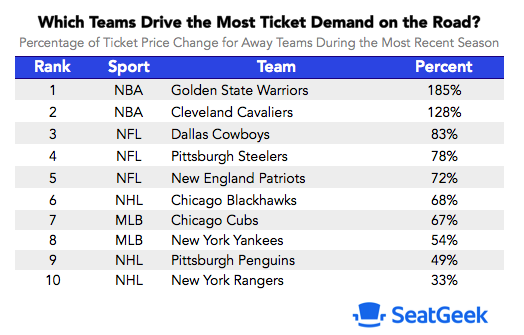 We analyzed data from Priceonomics customer SeatGeek, the ticket search engine, to determine which visiting sports teams cause ticket demand to spike the most. We looked at data on anonymized ticket sales on the secondary market from 2013 to 2017 to look at how different teams drive ticket demand when they’re on the road. Can the visiting team drive an increase in ticket demand? If a team has a really hot player, do fans seek out their team’s visit? We found that across all sports, the Golden State Warriors are the most attractive road draw with the biggest impact on ticket demand, increasing demand by 185% when they are the visiting team. The Cleveland Cavaliers were a close second, increasing ticket demand by 128% when on the road. The Dallas Cowboys, Chicago Blackhawks, and Chicago Cubs were all the largest drivers of ticket demand in their respective sports, but still lagged behind the Warriors and Cavaliers. We also found that sometimes a star player can have a large impact on ticket demand. When LeBron James left the Miami Heat, demand for tickets to see the Heat on the road dropped by 196% relative to the league average, while demand for the Cleveland Cavaliers increased by 143%. 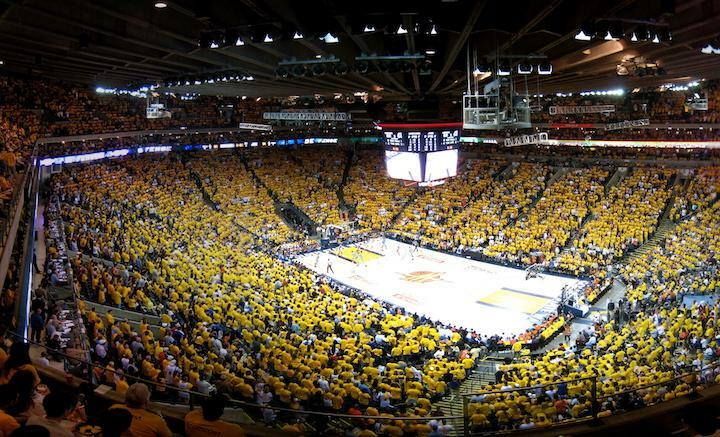 The team that experienced the largest increase in ticket demand from 2013 to 2017 was the Golden State Warriors, which saw ticket demand increase by more than 200%. To start off, we wanted to know which teams, across all sports, were driving the most ticket demand when they were on the road. To answer our question we used ticket sales from the most recently completed season. The Golden State Warriors and Cleveland Cavaliers are the most popular road teams in America, with the average resale price for tickets increasing by as much as 185% when those teams are visiting another city. NFL teams fill out the third through fifth spots, increasing ticket prices between 72% to 83% when these teams on the road. While other sports seem to hang together in the rankings, the NHL is split, with the Chicago Blackhawks increasing ticket prices by 68% when on the road while the Pittsburgh Penguins and New York Rangers increase demand by 33% to 49%. In seventh and eighth place, the Chicago Cubs and New York Yankees drive up ticket demand by as much as 67% when on the road. Next we decided to look at the top five teams that drove ticket demand in each league individually. Ticket demand more than doubles when the Golden State Warriors or Cleveland Cavaliers are the visiting team. The top five visiting NBA teams have the largest spread of how much they impact ticket demand. The Golden State Warriors and Cleveland Cavaliers, teams that have played each other in the NBA finals the past three years, more than double ticket prices when they are on the road. In a distant third through fifth place, the Chicago Bulls, Oklahoma City Thunder, and San Antonio Spurs increase ticket demand by between 24-28%. The Chicago Cubs increase ticket demand by 67% when they’re the visiting team. There are four major league baseball teams that significantly increase ticket demand when on the road. The Chicago Cubs are the most popular road baseball team, increasing ticket prices by as much as 67%, while the St. Louis Cardinals only increase ticket demand by around 3% when traveling. The Dallas Cowboys, Pittsburgh Steelers, and New England Patriots are the three most popular visiting NFL teams, all driving increases in resale ticket demand by over 70% when on the road. In fourth place, the Green Bay Packers drive ticket prices up around 31%, while the Seattle Seahawks increase prices by around 25%. The Chicago Blackhawks outpace all other NHL teams in driving up ticket demand when they are on the road. 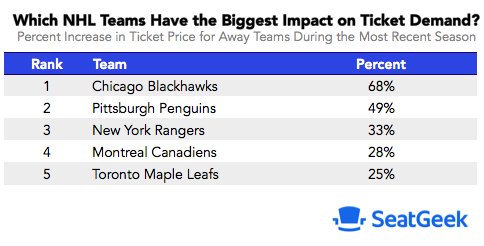 The Pittsburgh Penguins take second place, driving ticket demand up by 49%, almost 20% less than the impact the Blackhawks have when visiting. The New York Rangers (33%) and Montreal Canadiens (28%) fill out third and fourth place. In fifth, the Toronto Maple Leafs drive up ticket demand by around 25% when on the road. Next, we wanted to take a look at the top five teams who experienced the largest changes in ticket prices over the last five seasons. Who had the biggest increase in ticket demand during away games? Golden State Warriors top the charts again. 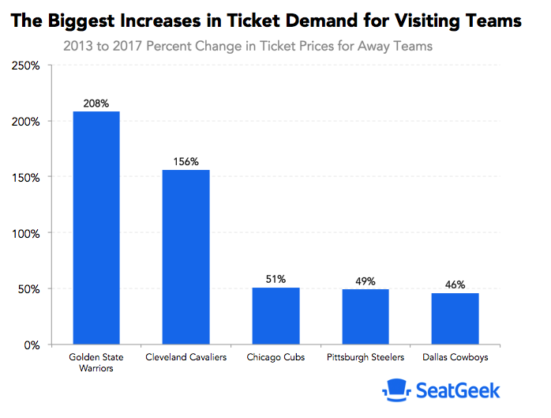 When we look at the biggest increases and decreases in road ticket demand across the past five seasons, we see that the Golden State Warriors (208%) and Cleveland Cavaliers (156%) experienced the largest increase in ticket demand. The Chicago Cubs, Pittsburgh Steelers, and Dallas Cowboys all saw ticket demand increase by around 50%. But what drives these five year trends in ticket demand? Could one player impact ticket demand for a whole team? We decided to test this by looking at one player who moved teams in the past five years: LeBron James. The largest single-player effect we found was when LeBron James left the Miami Heat and returned to the Cleveland Cavaliers. LeBron announced in July of 2014 that he would rejoin the Cleveland Cavaliers starting the following season, and the impact on ticket demand between the two teams was noticeable. From the 2013-14 season to the 2016-17 season, Miami Heat ticket demand dropped by 196% for road games, while the Cleveland Cavaliers experienced a 143% surge in ticket demand. Using five years of ticket sales data collected by SeatGeek, we were able to look at which teams drive ticket demand, the rise and fall of ticket demand for teams across five years, and the effect that a star player can have on ticket demand. We found that across all sports, the Golden State Warriors are the most popular road team in U.S. sports, increasing ticket demand by as much as 185%. The Dallas Cowboys drive ticket demand up the most for NFL games when on the road, while the Chicago Blackhawks drive the most ticket demand in the NHL (68% increase in demand). In baseball, the Chicago Cubs took the number one spot, increasing ticket demand by 67%. In addition, we found that in the past five seasons ticket demand for the Golden State Warriors increased by 208%, while increasing by 158% for the Cleveland Cavaliers. 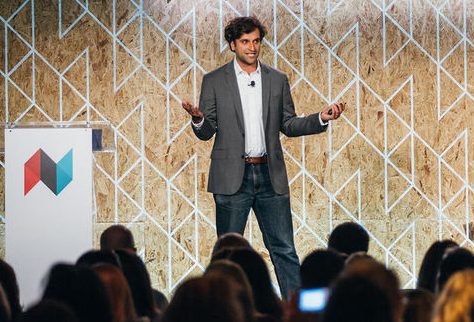 When we dug a little deeper into what drives some of these broader trends, we found that the movement of a star player between teams can have a large effect on ticket demand. 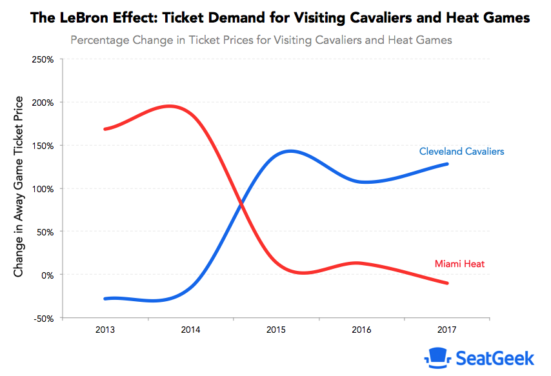 When LeBron James moved from the Heat to the Cavaliers, Cavs ticket demand increased by 143% while demand for Heat tickets decreased by 196%.